This entry was posted on Tuesday, September 8th, 2009 at 5:34 pm	and is filed under Montana Travel. You can follow any responses to this entry through the RSS 2.0 feed. You can leave a response, or trackback from your own site. 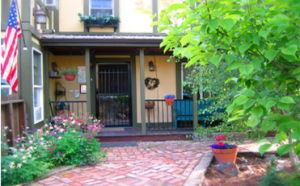 The Quigley Cottage B&B is an excellent choice if you plan on staying in the area. We’re repeat customers and are very satisfied with the accomodations. Especially the hosts … Dave and Davee Letford are really nice folks and; are happy to share their wealth of local knowledge and suggestions for things to do and see while you are in Montana. We highly recommend this B&B to others and look forward to our next visit to Philipsburg. A few years ago while staying at the B & B, we met a fun couple from another city in Montana. We had such a grand time making our own ice cream on the porch,and then more fun eating our ice cream, we decided to meet every year on September 1st. We made reservations right then and so far, we have been able to do so. It is great to catch up on our lives in this wonderful B & B. The minute you walk in the door, a feeling of “welcome” floods over you. And, the breakfasts are out-of-this-world delicious. Next visit, we are going up to Granite to see the mining stuff. This is a great place. Located a short distance from many day trip adventures. The host make you feel right at home, just like visiting those out of town relatives that you want to visit. Breakfast is outstanding and you will not got away hungary. Talking with Dave and Davee is also a pleasure and they will be able to give you guidance to things to do in the area. We hope that we can make it back to this part of our country again in the near future.